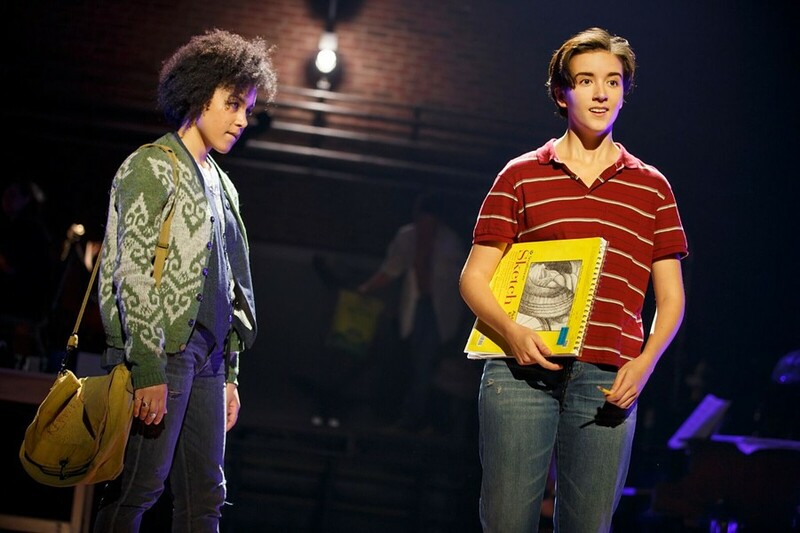 There's an unforgettably wanton, lascivious and joyful song nearly halfway through Fun Home, the Tony Award-winning musical that rolls into town next week, in which Charlotte native Abby Corrigan's character flips the script on her own life, and it's in this moment that Corrigan's talent shines brightest. Based on cartoonist Alison Bechdel's autobiographical graphic novel, Lisa Kron's script splits our hero in three, the middle-aged Alison who tells us the story and the two younger Alisons, Small and Medium, who live it out. Small Alison absorbs the first, often misleading impressions of her parents, Bruce and Helen. It's Medium Alison who discovers the revelatory truths — about her own lesbian leanings and about her dad's sexual pathology — after she goes off to college. The bold, beautiful, and seductive Joan sets Alison straight about herself, so it's Medium Alison who gets to jubilantly proclaim, "I'm changing my major to Joan!" as her first and most important college lesson, a defining moment in the play. Corrigan gets to sing this showstopping song beginning on Tuesday at Knight Theater in what figures to be a triumphant homecoming. It's certainly a sudden change in fortune for the young actress, who turned 19 in February — but not a surprise to those of us who have seen Corrigan perform. She leapt onto the local scene in 2008, while she was still 10 years old, as the incorrigible Gladys Herdman in the Children's Theatre production of The Best Christmas Pageant Ever. Corrigan remained on our radar, playing prominent roles in The 25th Annual Putnam County Spelling Bee down in Rock Hill, Next to Normal at Queen City Theatre Company, and delivering a riveting epileptic seizure to climax The Effect of Gamma Rays at CPCC. As the daughter of Mike and Mitzi Corrigan, both of whom acted in Charlotte Repertory Theatre productions, Abby figured to have acting talent. But Mitzi, a talent agent and casting director who has a professional's detachment, saw vivid signs of Abby's gifts long before she became the Herald Angel shouting "Shazzam!" as Gladys. "The first time I knew that she had something really special to offer," says Mitzi, "was when she was 6 years old and we did a backyard production of The Lion King. She was Nala, and when she sang 'Shadowland,' I was bowled over by how she became that character and I thought to myself, 'Wow, where did that come from?'" Knowing full well that you need intense passion and inner drive to survive in showbiz, Mitzi never pushed. Abby did plenty of pushing on her own. At the age of 12, Abby and friend Matt Mitchell started their own theatre company, Treehouse Acting Company, mounting their first production at CAST in NoDa. The following year, Abby, Matt and two other collaborators staged an original musical, Cybersoul, tackling a range of issues that included drug addiction, bullying, suicide and homophobia. You hear about precocious actors — many have paraded in and out of the Children's Theatre of Charlotte spotlight over the years. But have you heard of anyone else who started a theatre company and co-wrote a mature musical before high school? "It really was off the charts," Mitzi agrees. "I became good friends with Matt's mom and we wanted to help them find ways to pursue their dreams. Because producing backyard plays had become such a regular occurrence in our existence, it seemed like a natural step to encourage them to produce their own plays." Of course, Abby didn't think about measuring her ambitions against any norms. According to her mom, acting must be something you have to do in order to breathe if you wish to succeed. That's how it has always been with Abby. She remembers loving to imitate animals when she was very young, convincing herself that she was truly what she pretended to be. Her parents tried to deflect her into sports, but tee-ball never took. "I wanted to show people that I could become anything," Abby recalls. "As a kid, I would've played all the parts if I could have, and I wanted other kids to want to play along with me. I also think Matt and I wanted to play parts that we were too young to play. We would design sets and cast shows we wanted to do for fun, but we wanted to really do the work and make it happen." Inevitably, Abby's talents and drive took her to Northwest School of the Arts, where her theatre exploits — she starred in Cabaret, Shrek and Peter Pan – took her on a rollercoaster ride. At the crests, Abby was a finalist for Best Actress honors two years in a row at the Blumey Awards, winning a trip to New York for her Princess Fiona in Shrek and a chance to compete against winners from across the country at the national Jimmy Awards, the holy grail of high school theatre prizes. Just as that brass ring was within sight, the opportunity to perform in front of top Broadway professionals vanished. Initially misdiagnosed in ER, Abby's appendix ruptured, sending her back into the hospital, and she had to give up her spot at the Jimmys to the Blumey runner-up. Opportunity lost, but Abby was happy just to be alive. She returned to Belk Theater the following season, once again performing onstage as one of the Blumey finalists, but she didn't win. "I didn't want to win that year," Abby says. "I just wanted to do 'Ugg-a-Wugg' with my cast because it was so much fun to scream and bang the ground with sticks onstage as Peter Pan. I mean, come on. That's what should matter. Not an award." Abby wasn't totally exiled from New York because of her misfortune and subsequent defeat. For a couple of summers, she participated in a Destination Broadway theatre camp where the musical director was conductor Michael Rafter. It so happened that Rafter is the ex-husband of Jeanine Tesori, who wrote music for the "Changing My Major" song — and the entire Fun Home score. When Mitzi invited Rafter to be the keynote speaker at a Northwest fundraiser, he informed her about Fun Home auditions. Opportunity was knocking again, but how ready was Abby for it? Medium Alison doesn't merely participate in this touring version of Fun Home, she drives the action. "Yes, I about peed myself walking in the audition room those three times," Abby confesses. The last two of those auditions were in front of three Tony Award winners — Kron, Tesori and stage director Sam Gold. "I'd never wanted anything more in my life. After my first audition, the casting director gave me tickets to see it on Broadway, and I knew I had to do the show. I just wanted to eat the script/score whole." There are easier people to reach than Gold, especially during this year's Tony Awards weekend, when he was up for a second Best Director trophy for his work on A Doll's House, Part 2. Busy as he is, he had no trouble remembering Abby's audition from a year ago, when she was still 18. "Abby's audition was one of the best and most memorable of my career," Gold tells me. "It was like seeing the character of Medium Alison in front of me. She had worked very hard on the material and it was deeply felt, full of detail and comic timing, and she exuded confidence. When we spoke after, she said she was about to graduate, and I said, 'What college do you go to?' She said, '...from high school!' I couldn't believe the poise and professionalism I saw was coming from an actor who would barely be of age for the tour." Both the poise and the professionalism are somewhat paradoxical in an actor who says she's constantly striving to maintain the curiosity, fearlessness and joy of a kid when she works — but her mom finds that onstage poise is just as genuine offstage. Time and again, Mitzi has come across the rejection, the ugly desperation, the deformed egos and the over-swelled sense of entitlement that stalk theatre people — and she has seen the beauty and happiness it brings to Abby. "Letting her go has been the hardest thing in the world for me," Mitzi admits, "but she continually reassures me by saying, 'Don't worry mom. I've got this!' Those words are like music to a mother's ears."